Indulge in effortless youthful sophistication courtesy of the alluring Michael Kors timepiece collection. This chic stainless steel and gold tone fine link bracelet watch is styled with a sleek silver tone, round dial, with a glittering stone set bezel for a splash of glamour. 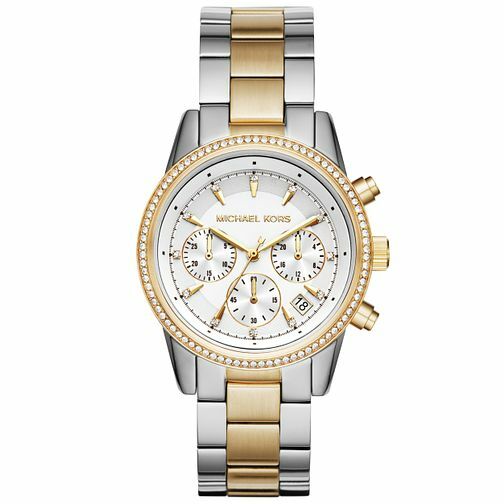 Michael Kors Ladies' Two Colour Bracelet Watch is rated 5.0 out of 5 by 2. Rated 5 out of 5 by Anonymous from Really lovely quality watch I bought this watch as a treat for myself and I'm really pleased with it. Looks really nice on and is very subtle.